Physicists at the University of Rochester have combined an atom-chiller with a molecule trap, creating for the first time a device that can generate and trap huge numbers of elusive-yet-valuable ultracold polar molecules. Scientists believe ultracold polar molecules will allow them to create exotic artificial crystals and stable quantum computers. The Thin WIre electroStatic Trap, or TWIST, is the first electrostatic polar molecule trap that works simultaneously with a magneto-optical atom trap. This means Kleinert can use the lasers of the magneto-optical trap, or MOT, to chill atoms to just a few millionths of a degree above absolute zero, then force the atoms to group into molecules, and instantaneously hold them in place with the electrostatic TWIST trap. Traditionally, a complex process of creating and trapping is required to produce these molecules, akin to repeatedly emptying and refilling the ice cube trays in your freezer, says Kleinert. A MOT with a TWIST, however, can create and store the chilled molecules in one place, instantly—more like a refrigerator with an automatic icemaker. While polar molecules are literally as common as water, and dozens of laboratories around the world can cool atoms to such extreme temperatures, creating an ultracold polar molecule is difficult. Ultracold atoms can combine into molecules, but since only one type of atom can usually be cooled at once, the molecules it makes are electrically symmetric, not polar. Physicists have to either chill regular polar molecules, or chill several types of atoms at the same time and force them to join into molecules. Both processes are so complex that Kleinert says only four laboratories in the world do them, and the yield of ultracold polar molecules until now has been very low. The TWIST, developed with Kleinert’s advisor, Nicholas P. Bigelow, Lee A. DuBridge Professor of Physics at the University of Rochester, makes the complex process much more efficient, and thus makes available many more of these molecules. The secret to the TWIST is the precise thickness of the tungsten wires that loop around the molecule-production area. In Kleinert’s design, atoms are chilled with the lasers of a MOT, which drains away the atoms’ energy, chilling them to nearly 460 degrees Fahrenheit below zero. So far, this is exactly the same as the traditional method, but Kleinert surrounds his target area with tungsten loops that create an electric field. The field has no effect on the chilled atoms, but as the atoms are grouped into polar molecules by a process called photoassociation, the new polar molecules, with a positive charge on one side and a negative charge on the other, are affected by the field. The electric field has a gradient, and due to some of the strange properties of the quantum world, polar molecules tend to “slide down” that gradient, collecting in the center of the field. As a result, says Kleinert, the TWIST collects and holds the low-field seeking polar molecules but lets other unaffected particles, such as atoms or other molecules, simply drift away. Those tungsten loops have to be thick enough that they can withstand the electrostatic forces they generate, but thin enough that they don’t block the MOT laser initiating the cooling. After months of trial and error and a lot of burned-out tungsten wire, Kleinert found that wires just the width of a hair provided the perfect balance. 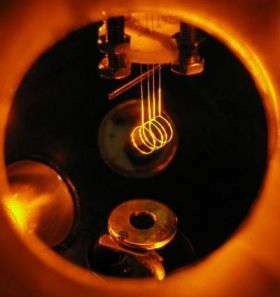 With a good supply of ultracold polar molecules, computer scientists would have a new tool with which to tackle the creation of quantum computers, says Kleinert. Quantum computer scientists are attracted to ultracold particles because their temperatures reduce decoherence, a phenomenon where your system decays from the carefully prepared quantum configuration you started with, to a classical physics state, which loses all the advantages quantum computers hold. Ultracold polar molecules in particular are especially attractive because their strong polarity allows them to interact with each other over much larger distances than other atomic particles, and the stronger the interaction between particles, the faster a quantum computer can perform certain operations. Ultracold polar molecules may even allow scientists to venture into an unknown quarter of the Standard Model of Physics—the size of the electron, says Kleinert. The answer to whether the electron has a definite size or is just a dimensionless point in space could support the Standard Model, or support one of the many alternate models. Trying to approximate the electron’s size would likely require ultracold polar molecules, which can have 100 times the sensitivity of simple ultracold atoms. That difference could be enough to make a definitive measurement supporting or chipping away at the Standard Model altogether.